This oil painting took me years to paint. I have a deep love for Egyptian theology and the love story of Isis and Osiris. In 2008, this painting was originally inspired by a broken heart. I think I must be a big romantic! Anyway, I fell for a guy who was a very different faith to me and although we both had faith in something greater than ourselves, it was dogma that came between us. So when this love tryst finished, I put my love and creative energy into this painting. Over the years, this painting has seen many layers and changes from conveying a coldness to this passionate and loving image now. As I painted this canvas, I remember spending a lot of time reliving emotions that opened my heart and allowed my love to spill forth. It was as though I was emotionally transported into the painting and time meant nothing to me. It was a sacred act of painting, something beautiful and indefinable that happened between myself and that which appeared on the canvas. I love the warm passion in the image now. 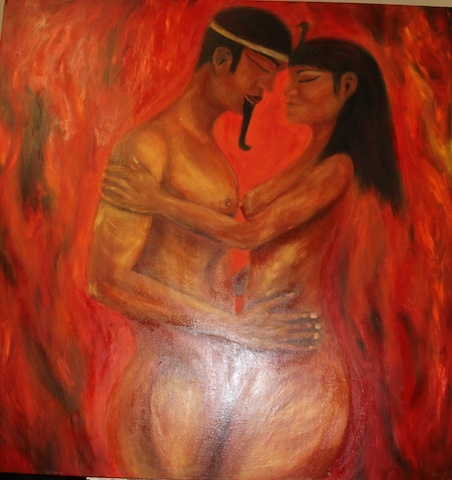 I still have the painting with me and when I look at it, I think how the act of love making can be a passionate and sacred act of expressing love between two beings. I love the relationship between Isis and Osiris where she pieced him back together after he had been torn apart by Seth. I love that Isis fashioned a phallus out of gold, allowing them to make love and create new life through Horus. It is tragic in a way because Osiris dies after their last moments of passion and expressions of love. In a symbolic manner Osiris dies only to be reborn through his ‘seed’ which is Horus, the Son. As with all my artwork, there is deep meaning. Layers and layers of symbology goes into what I create. I ponder the story and how it relates to my life and to life in general. This painting also symbolically represents the transitions of life, the cycles that humans and nature go through, being birth, life, experiences that shape us and death, only to become one with the earth again and transition from one form to another. Divine Love, Isis and Osiris touch, meld together in a union of one-ness to create new life and renewal. I love it, deeply.